Johnson's Northern Italy. Lombardy, Venice, Sardinia, Tuscany, Parma, Modena, Lucca and the States of the Church. / Johnson's Southern Italy Kingdom of Naples, I. Sardinia & Malta. 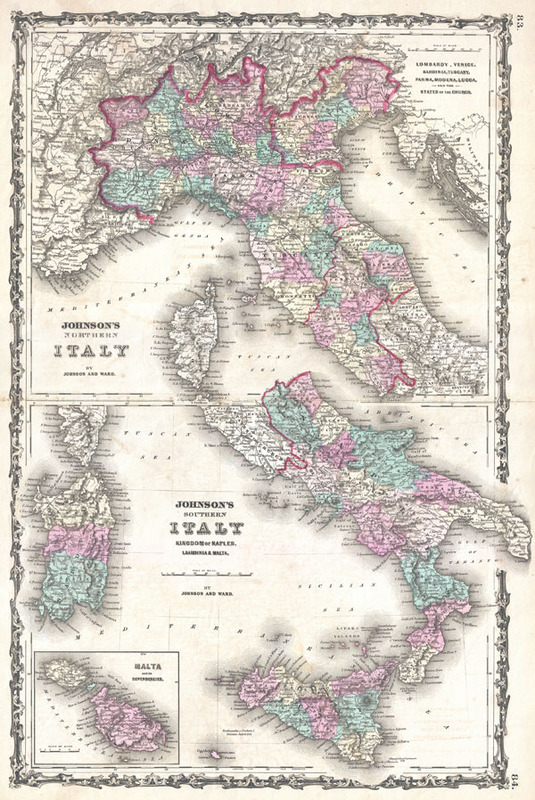 A very attractive example of Johnson's 1862 map of Italy. Details the entire peninsula as well as Corsica, Sardinia, Malta and Sicily. Color coded according to region. When this map was made Italy was in the midst of its struggle for National solidarity under Giuseppe Garibaldi and his Red Shirts. Naples and Sicily were independent, as were the Papal States, and the Venetian States. Most of northern Italy was consolidated with its capital in Florence. Features the strapwork style border common to Johnson's atlas work from 1860 to 1863. Published by A. J. Johnson and Ward as plate numbers 83 and 84 in the 1862 edition of Johnson's New Illustrated Family Atlas. This is the first edition of the Family Atlas to bear the Johnson and Ward imprint. Very good condition. Original centerfold exhibits minor wear. Light overall toning.